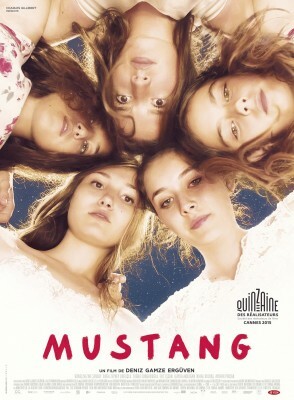 By partaking in a game of chicken with some boys on the way home from school, five precocious girls in a small Turkish town unknowingly change their lives forever. When a neighbour tells their grandmother that they were engaging in obscene behaviour, the girls find themselves prisoners in their own house. Their warden, an uncle, grows increasingly conservative and protective over the girls. At first the girls make the best of their situation. Although they are extremely bored, they manage to entertain themselves with each other’s company. However, their uncle and grandmother plan to marry the girls off, and as the sisters are separated, their situations become more bleak. Mustang is simultaneously heartwarming and heartbreaking. As the happiness in the sisters’ lives starts to diminish, the shining light is the hope and resilience of the youngest sister, Lale, who we follow throughout the film. Lale and her sisters’ rebellious spirits shine even as their uncle forces them into more restrictive traditional gender roles in order to save the girls’ reputations and find them husbands. The sisterhood between the girls is palpable and you can’t help but fall as in love with them as they are with each other. Each of the young actresses does an amazing job, and their relationship feels real. Although primarily a drama, Mustang has some amazing comedic moments, the best of which is an unexpected reaction from their aunts after the girls sneak away to attend a soccer game. As the girls struggle to deal with their separation and the sexual obligation forced on them by marrying at a young age, the tone of the film starts to shift, and the comedy seeps away. The first wedding scene we see is a raucous affair full of celebration and excitement. Later, a wedding scene begins in the same way as the first, but you can feel that the tone is entirely different. This comparison is one of the many reasons Mustang works so well. The spirit in the girls in the film is inspiring, as much as what happens to them is sobering, leaving you with a bittersweet, yet satisfied aftertaste.